In order to foster both educational and emotional growth in preschool children, there are several different recommended preschool activities you can do with your child. 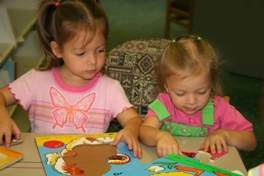 You can look for great activities in such areas as reading, singing, and puzzles. Your child will have a lot of fun and experience real educational and emotional growth. Reading to your child is one of the best preschool activities you can do. Your public library has a large selection of children’s books. Books allow your child’s mind to be opened to new ideas. It also develops an interest in reading and can help your child become an early reader. You can choose a time everyday to read to your children. Another great idea is to check out the times that your public library will have a librarian that read books to a group of preschool children. It’s a great chance for your children to interact with other children. Teaching your child songs is another great way to enrich their emotional and educational wellbeing. Of course there are the popular educational preschool songs like the ABC song and the number song, but you can be creative. Try learning the songs from any videos you might have for your children. Sing the song with them and teach them all of the words to the song. It will help your child improve their vocabulary and understanding. Puzzles are a great way to help your child understand shapes and sizes and how they fit into the world around them. Puzzles are good for all ages. It’s a good idea to start with simple puzzles so that they complete the puzzles without getting discouraged. This is an activity you should do alongside your preschool child so that you both can bond. Don’t help too much and as your child finishes puzzles, opt for slightly more difficult ones the next time. These preschool activities will help your child grow and be enriched. Make sure you have fun with your child when you do thee activities. These times are sure to become fond memories as you both grow older. Try to make bubbles that soar the highest, or are the biggest, or travel the farthest. Bubble blowing is one of those activities that’s sure to bring out smiles at any age! Let your child help you make the bubble blowing recipe, it’s easy and very cheap to make. Shake gently and let settle for four hours. Store covered in refrigerator to extend suds shelf life. Allow to warm before using. Costs about $1.50 per gallon. 1. If foam develops scrape off with a piece of thin cardboard. 2. Keep suds clean from grass and dirt. 3. Bubbles are best on humid days. 4. Keep the bubble solution out of direct sun. Playdough is fun, sparks creativity, and provides hours of fun that also helps with a child’s motor skills. Finger painting is a great preschool activity, children love the messiness of it all and it’s very easy to make. 1. Mix all ingredients to the consistency of thick gravy. 2. Add food coloring as desired. Small margarine containers work well for the individual colors. Go to the next page for more preschool activities.